My Creative Existence: Steampunk Baby Card. * Little Dreams stamp set. * Steampunk stamp set (the top hat and the cogs). * Alphabet Medley stamp set. * Small & Large Manilla Tag. * Distress Ink -Tattered Rose, Victorian Velvet. I created the background by sanding gloss cardstock, sponging with Tattered Rose Distress ink, and then stamping the scratches background stamp with Victorian Velvet Distress ink. I then stamped the baby wordblock stamp onto the background with Old Rose Versacolor ink, and added some vintage look lace. 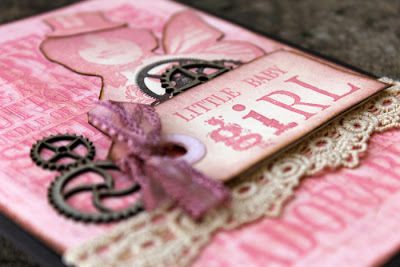 I stamped "Girl" onto a small manila tag with the Alphabet stamps, and the "Little" and "Baby" comes from the wordblock stamp. To avoid getting the placement wrong, I actually cut those words out of the wordblock stamp and stamped them individually. Don't worry - I cut them with one line so that I can slot them back in when I need to use it as a full stamp again! 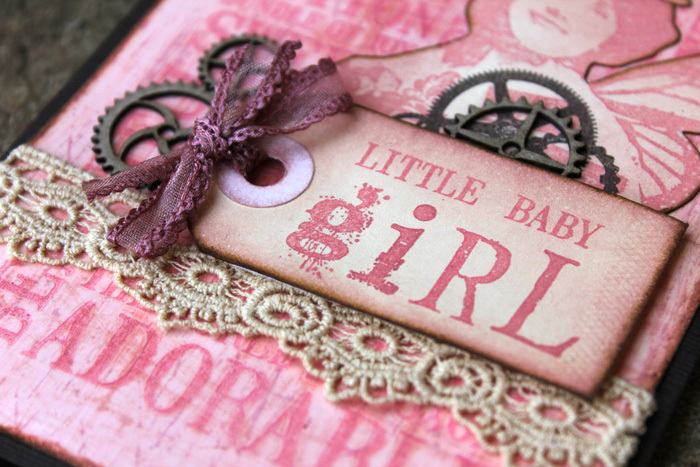 The tag was then sponged with Tattered Rose distress ink and threaded with a dusty pink ribbon and mounted to the card with foam tape. I stamped the lay and the hat onto a large manilla tag and sponged them with the tattered rose distress ink. They were cut out, and edged with Vintage Photo Distress ink. 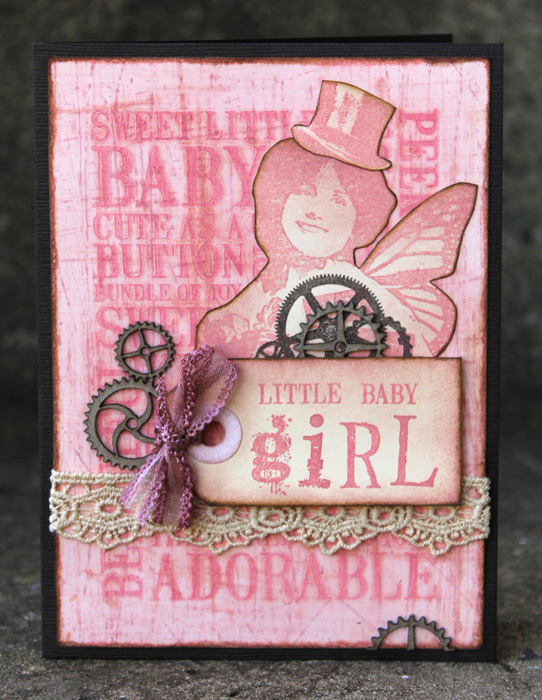 I then stamped the cogs from the Steampunk stamp set onto the lady's body with Timber Brown Stazon. To finish, I added some raw chipboard cogs from Twiddleybitz - LOVE these!! I'll sare the other cards I created here soon - but if you want to check them out now you can see them on the Darkroom Door blog here. While you're there, leave a comment for your chance to win a Wordblock stamp of your choice!